Life, cards, luck and Russian Roulette... this is why this comment has the spoiler option checked. This film evokes Valencia illegal gaming back in the seventies. A young peasant -Ferran- plays cards not much to make a living but as a distraction of his daily routine. Ferran meets a larger-than-life character -el chino- who happens to play cards for a living. This other guy is depicted as a Toni Manero look alike but his charisma an arrogance lead the innocent Ferran to join him in his schemes to make money to end up betting all on the next card table. 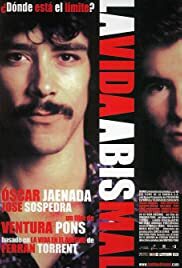 At some point the action moves to Madrid and Ferran steps down losing track of El chino who takes on more dangerous games making a living out of Russian Roulette until the round gets loaded. Based on real events this is no Hollywood epic but it captures the desperation of the characters very effectively.